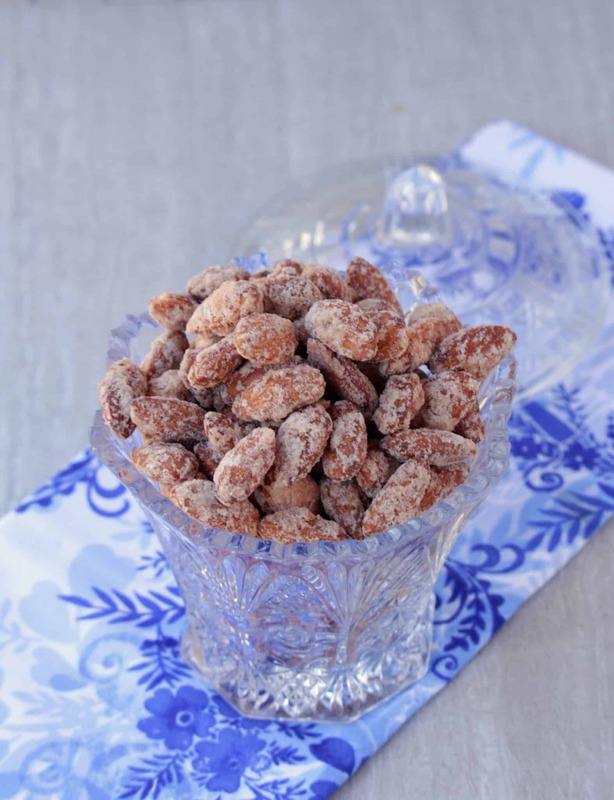 Almond, Sugar and cinnamon is all we need to make this quick and easy Candied Almonds on stove top. 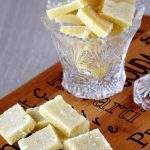 This week my theme for BM is Easy Sweet treats ready within an hour or less. 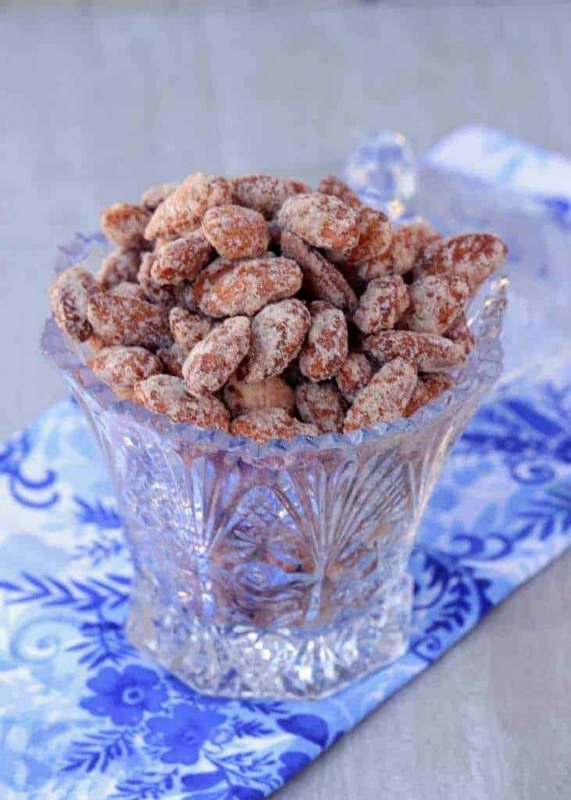 The first recipe I have under this theme is this Candied Almonds that just takes 3 ingredients to make and is ready in about 12 to 15 minutes. Snacks are a big deal in my house and if I am not watching the kids would empty every shelf on the snack aisle. 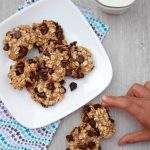 Many says I try to have something healthy and flavorful snack ready for them but still the bright colors and the flavors of the shelf do attract the children and also the adults. My boys love the candied Pecans from our local Sprout’s market. Though they are made of organic ingredients, I still do not like the additional ingredients that go into making them. I wanted to try to make something very similar, but every time I went shopping, I kept forgetting to buy pecans. 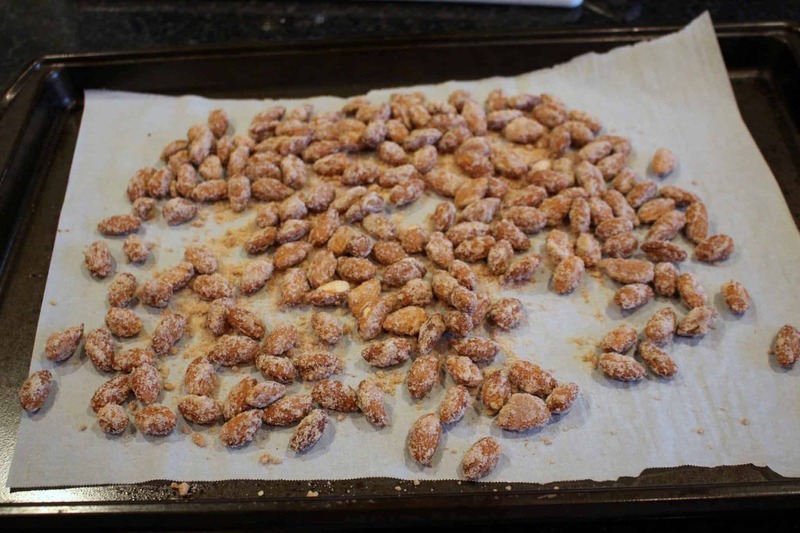 Today I wanted to not make it a excuse and hence tried to make candied almonds. I have had many of my friends and readers mention how scared they were to make caramel or deal with making sugar syrup. I have to admit that it is indeed a learning curve to make perfect caramel and even the experienced cook might have trouble at times. 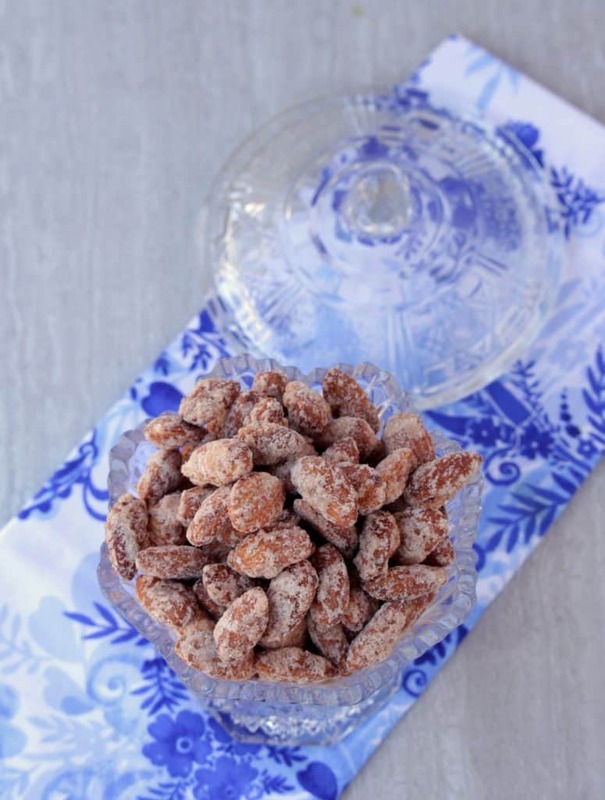 The many terminologies like single thread consistency, soft ball consistency and hard ball stage could be overwhelming at times and hence I wanted to try out a way to make this the most Easiest Candied Almonds that one would ever make. 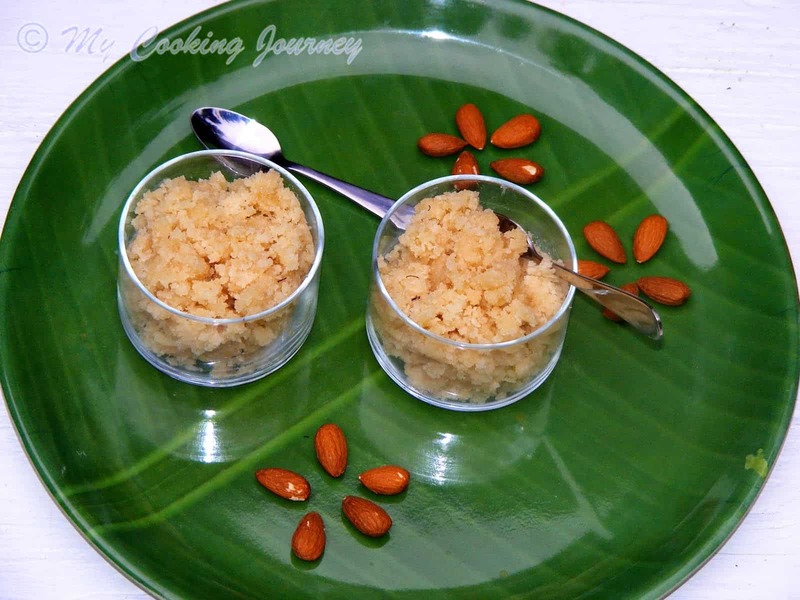 Last year I had make this traditional Indian recipe called Nokkal which involved making a sugar syrup in single thread consistency. It did yield an amazing candied cashew, but I didn’t want to use the same technique as it could be a little overwhelming to beginners. So this recipe here does not need any of the consistency checks. All we need to do is combine the sugar and cinnamon with little water. Heat it over the flame until the sugar melts. Then we add the almonds and keep stirring it in medium flame until the mixture solidifies and the sugar coats all over the almonds. Simple, isn’t it? I have chosen to add cinnamon to spice it up the bit, but you could be as creative you want with the spices. We could add nutmeg, all spice, cayenne or anything that you prefer and think would work well with the almond. Make sure you use good quality Almonds. 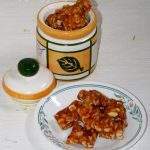 If the almonds are older, I would recommend toasting them in a pan or in the oven for few minutes and the cooling it down entirely before making the candy. Line a baking sheet with parchment paper and keep it ready. Measure the ingredients. If the almonds are a little old, then roast them in a pan for few minutes until they are aromatic. Cool them down to room temperature. I had bought some fresh almonds, so I skipped this step. In the same pan, add the sugar, cinnamon and water and mix. Heat the sugar in low to medium flame. Mix well to dissolve the sugar. Once the sugar starts to boil, add the almonds to the pan. Keep stirring the mixture in low flame until all the moisture disappears and the sugar coats the almonds well. Once the almonds appear dry, turn off the heat and transfer the mixture to the prepared baking sheet. Separate the clumps if there are any and then let the almonds cool down entirely. Store in an airtight container once they have cooled down entirely. Fantastic Snack Sandhya. When you made those Nokkal I was so tempted to make it myself. 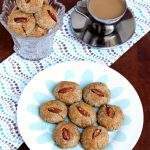 I don’t like cashews however almonds are my favorite..so won’t mind making these. I looooove candied and seasoned almonds! Actually, I love most nuts like that! 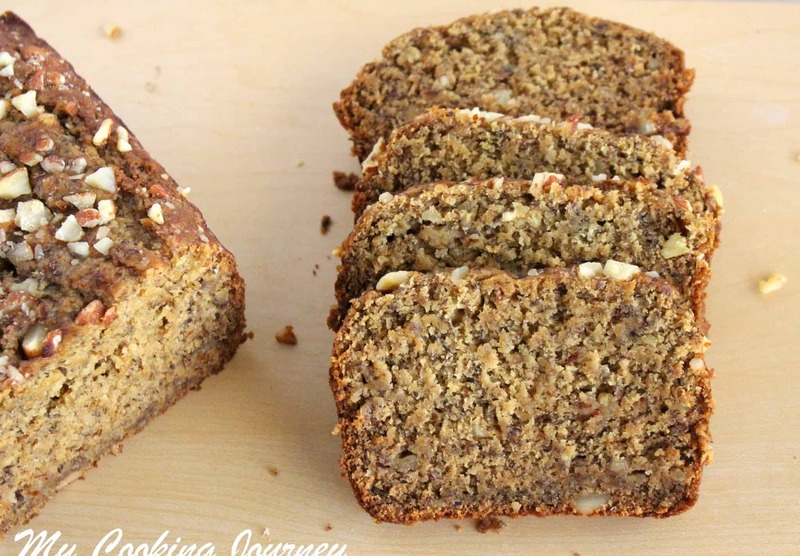 This is so easy and delicious looking– I need to try it! Oh my! Two magical ingredients – almonds and cinnamon. 🙂 I love, love, love anything cinnamon flavoured. And, I love almonds as well. Did you use dry, unroasted, natural almonds? Or were they dry-roasted? Candied nuts remind me of walking around the mall around the holidays and the sweet smell of candied nuts wafting through the entire shopping center. I can only smell it for so long until I find myself standing in life to grab a bag. I’m so happy I can make them at home, all year round now! These are one of my favorite treats! Especially hot right out of the oven. All warm and chewy. Great recipe! 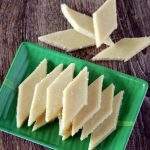 3 ingredient recipes are like a dream come true! I absolutely love candied nuts, especially almonds. They look perfect and delicious!! Haha I’m eating almonds as I’m reading this 🙂 It’s a sign. Mine are plain ones though and these look 100% tastier! I have a big bag of almonds waiting for me at home, you bet I will try this! 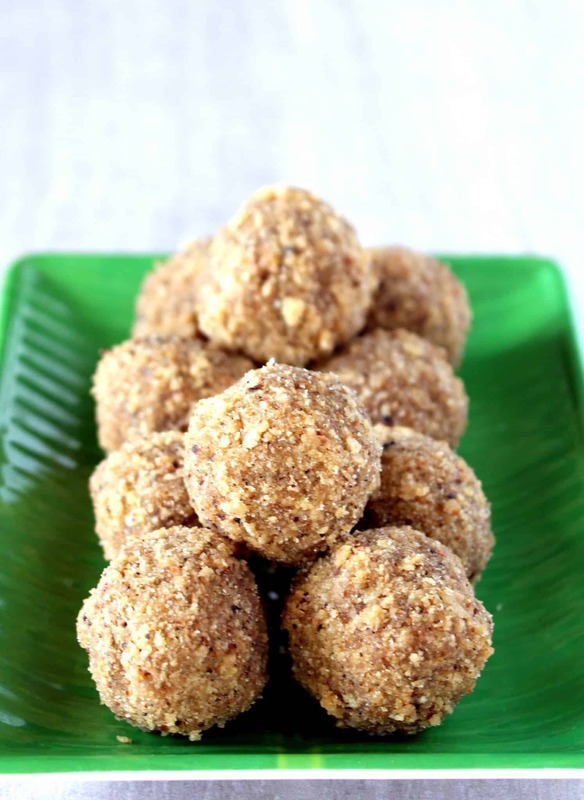 This is so new to me.It’s perfect to snack on.Great recipe and bookmarked to try. You certainly can’t go wrong with this snack. Not only are almonds good for us but cinnamon is too. I like that it comes together in just a bit and the ingredients are some that we have in the house. I wish I could a bowlful right now! 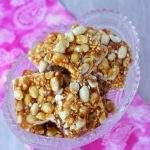 I can see myself munching on bowls of these delicious sweet and crunchy nuts. The recipe seems easy enough to make too. These candied almonds remind me of my days working in the mall across from the candied nuts store! Oh I ate my weight in those! I always knew it was so easy to make them myself and now I’m going to make them for book club next week!! My husband and father love these! I love how simple your recipe is to make, nice and easy. I love candied almonds but have never tried to make it at home. I like the sound of adding cinnamon in this recipe. Thanks for the tip! OMG I love candied almonds! These couldn’t be easier to make. Candied nuts are my total weakness. Here in Philadelphia, we have a gourmet grocery store called DiBruno Bros, and they make the most incredible hand-roasted candied cashews and pecans. 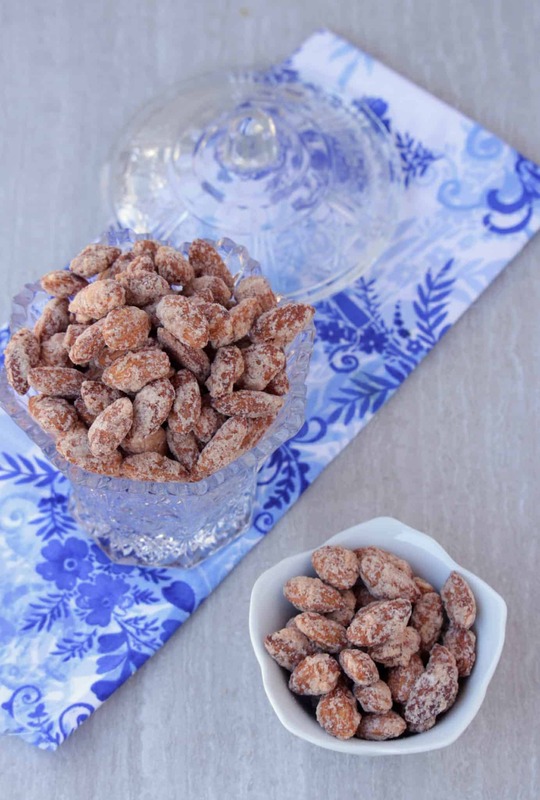 Your candied almonds look similar, so I imagine they are quite addictive! 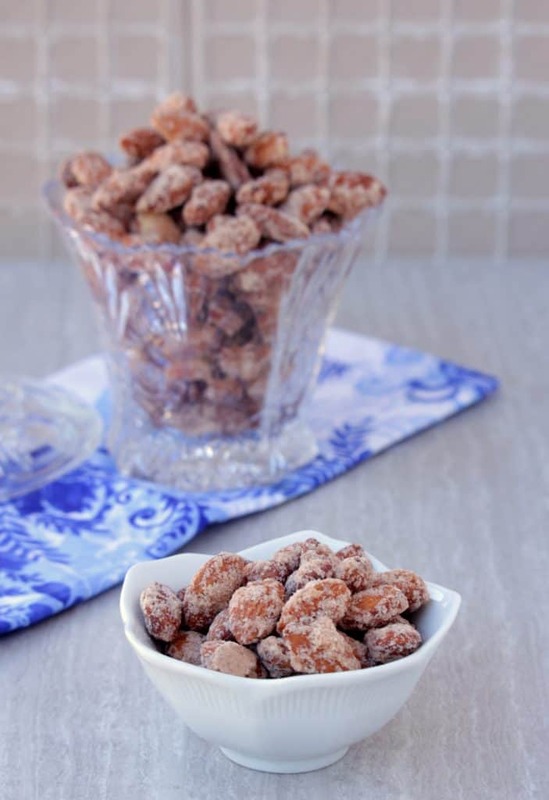 Wish i get a huge box of this candied almonds, feel like munching some rite now. Wow super tempting almonds there. 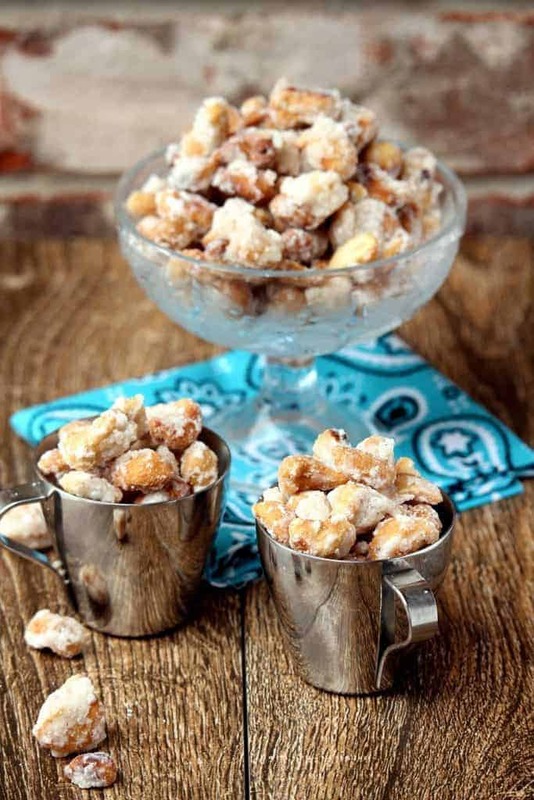 This is such an easy way of making candied nuts. 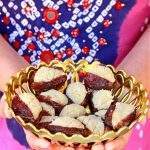 They look so inviting..
love the candied or roasted nuts,.. perfect for anytime muching items.